Recently I was reading the wonderful book Sapiens: A Brief History of Humankind by the Israeli writer Yuval Noah Harari (originally written in Hebrew in 2011, English translation is published by Signal books, UK, 2014). Reading this book reminded me about some of my old thoughts on ancient Indian myths and the prehistoric humans such as the Neanderthals. Many decades ago, while reading the old Indian sacred stories, I used to wonder if some of the people described in them such as asur, danav, rakshas, and vanar, could have been references to other human species. This post explores some of those ideas about the non-human persons in the sacred books of Hinduism including Veda, Puranic stories and epics like Ramayan and Mahabharat. I am not claiming any scientific rationale behind these ideas, they are just speculations. The images used in this post are from the north-east of India and show depictions of those persons in the temples, folk-art and folk-plays. Homo sapiens, too, belongs to a family. This banal fact used to be one of history’s most closely guarded secrets. Homo sapiens long preferred to view itself as set apart from animals, an orphan bereft of family, lacking siblings or cousins, and most importantly without parents. But that’s just not the case. Like it or not, we are members of a large and particularly noisy family called the great apes. Our closest living relatives include chimpanzees, gorillas and orang utans. The chimpanzees are the closest. Just 6 million years ago, a single female ape had two daughters. One became the ancestor of all chimpanzees, the other is our own grandmother. European theories of encounters between different people in India: European academics and indologists from 19th century had popularized the theories of Aryan invasion and proposed that people of south India (Dravidians) were pushed southwards by those Aryans coming into India from the west. They had also proposed that fair-skinned Aryans had exploited and subjugated dark skinned indigenous populations of ancient India and forced them into specific caste groups (shudra) or outside the caste system (untouchables). 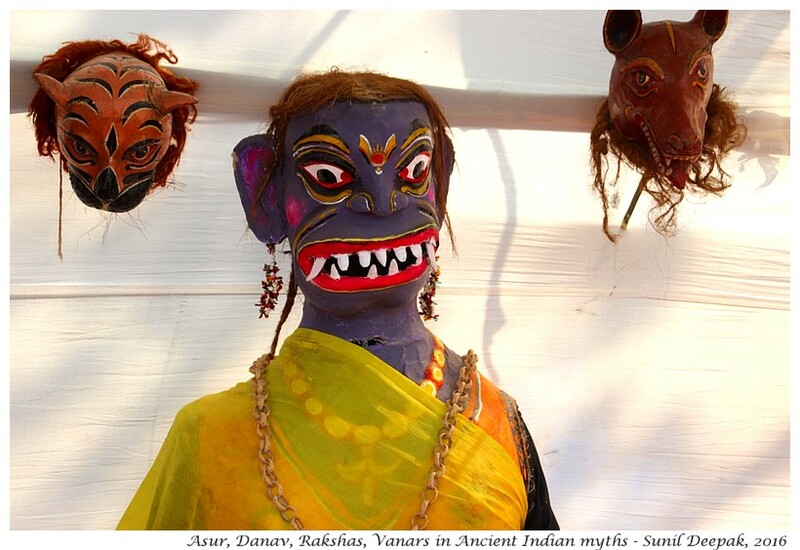 They had argued that groups like Asur and Rakshas described in the ancient Indian tales were actually Dravidians and other indigenous people of India. These ideas have been widely accepted both in India and internationally. For example, many people believe that the more than three thousand years old Harappa and Mohanjodaro civilizations in the Indus valley had disappeared due to Aryan invasion. Only during the last couple of decades there have been doubts about the invasion theories since they have not found matching archaeological or documentary evidence or the evidence is non conclusive, to support this theory. However, objective discussions on this theme are sometimes difficult because certain Hindu groups see the Aryan invasion theory as diminishing of their claim to be original inhabitants of India. At the same time, objective discussions are difficult because many leftist scholars see them as efforts to pander to conservative Hindu groups. Alternative hypothesis of encounters between different human species in Indian myths: However, I used to think that the Puranic stories and myths of ancient Indians could have been orally transmitted stories of the prehistoric humans, who could have travelled from one continent to another over thousands of years, enriching those stories with events from their own lives and passing them on to their younger generations. So my thought was: what if the asur, danav, pichash, rakshas and vanar of those stories were other species of humans who might have lived on earth at the same time as the Homo sapiens? 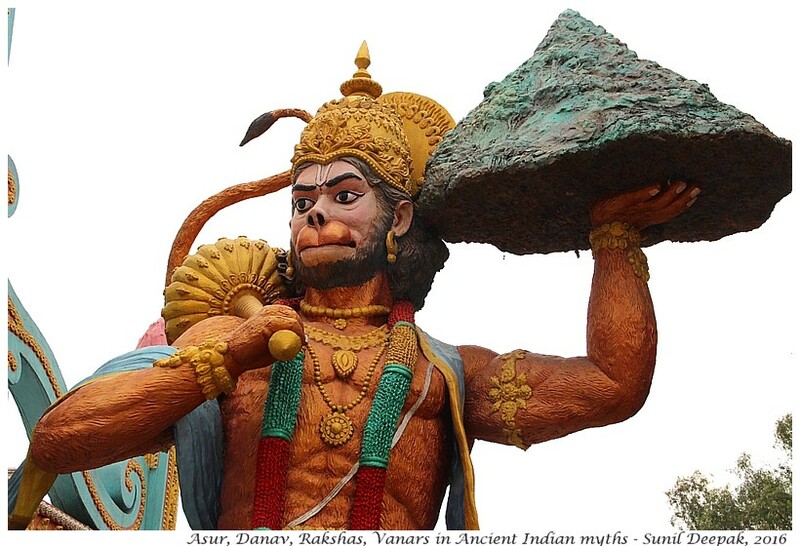 What if stories like those of the vanar kingdom from which Hanuman comes, which is described in Ramayan, are based upon much older stories from the millennium-long oral traditions and refer to our humanoid ape ancestors from which the different human species took birth and who were our species-cousins? The Puranic stories talk about the birth of deva (humans) and asur from the same father Brahma and their subsequent fights. Similarly the stories linked to rakshas like that of Ravan, mention the highly developed cultures of these people and their rich cities full of gold (Lanka). I do not think that we can take these stories as literal truths or histories. Indian traditions have looked at, analysed and understood these myths in diverse spiritual and metaphorical ways. Can we confirm these ideas? : When the human genome mapping project had come up, I had thought that genome mapping could give the answers about inter-mixing between the different human species. For example, genome studies have shown that 1 to 4 percent of Europeans and Asians have some Neanderthal genes. Another recent report about a genome study by Sriram Sankararaman of California university and David Reich of Harvard University has shown that a higher than expected percentage of south Asians have genes of the Denisovan species of humans. People of Oceania and Pacific have even higher number of persons with these genes. Thus, these studies suggest that at least some degree of inter-mixing between human species did take place. However this does not prove that the other people mentioned in Indian myths and ancient books were other human species like Neanderthals and Denisovans. 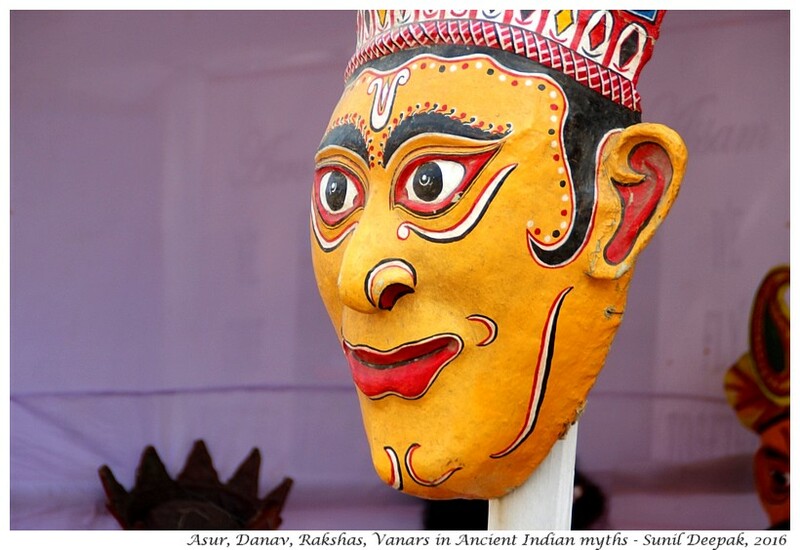 The continuity of the living oral traditions in India: Another questions I have asked myself is - if it is true that the Indian myths carry memories of the prehistoric encounters between the different human species, are there similar myths and old stories among other cultures and people? We share many myths with other cultures. For example, the floods of the Genesis Narrative are a common myth in different parts of the world, from Noah in the Bible to Sumerian and Babylonian myths, and the primordial floods described in the Indian myths of Manu. So why we have not found other myths and stories of encounters between Sapiens and other species of humans? One answer can be that the myths and ancient stories of people could have included stories of encounters between different human species, but those stories are not accessible today. Or that these stories are there but they have not been thought/understood in this way. Another answer can be that the relatively new religions like Christianity and Islam have suppressed many of the old myths of the oral traditions of the ancient people. On the other hand, India has had a very strong tradition of keeping alive the oral narratives and customs. For example, a group of persons in Kerala still continues and conserves the tradition of chanting of ancient vedic sounds, whose meanings have been lost with time. 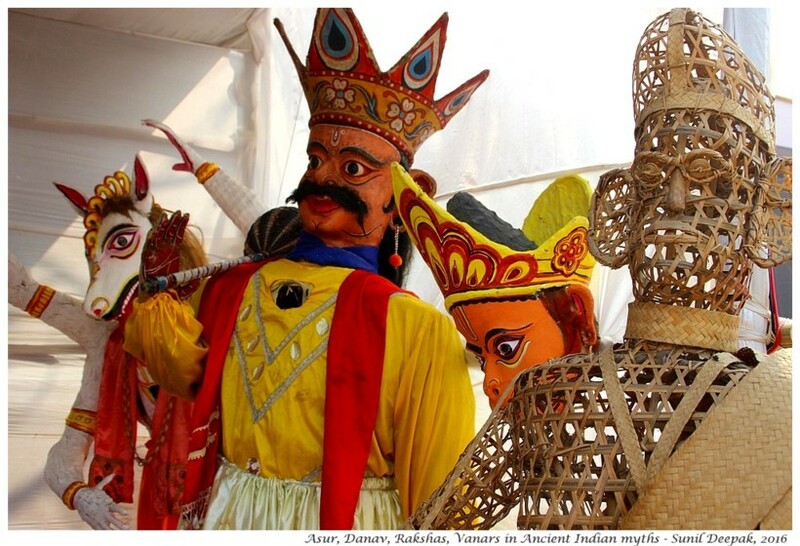 Thus, these are living traditions in India and not just things that are found in museums and old manuscripts. Another factor influencing the continuing presence of old stories in India is because Hinduism is composed of hundreds of different belief streams, none of which can claim to be dominant or more legitimate than others, which makes it possible for the acceptance and continuing adaptations and relevance of old myths and sacred stories. 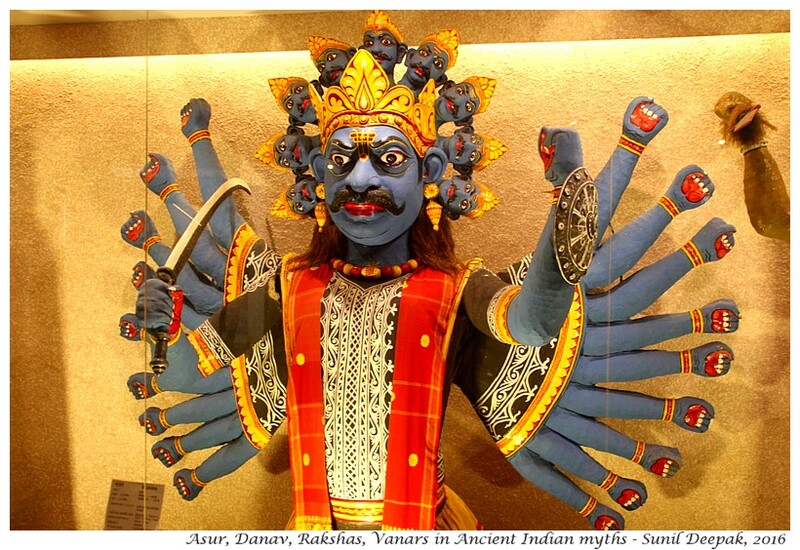 In India the myth-recreation and re-elaboration process is active and ongoing even today. For example, in popular Indian culture public figures like Mahatma Gandhi and Ambedkar, as well as some film actors and politicians, are regularly turned into gods with building of their temples and making of new myths and stories about their exploits. Perhaps that is how, ancient myths of encounters between different human species could have found resonance in relatively more recent stories of exploitation between different castes, and thus these continue to be woven and used in different ways in contemporary India! Conclusions: Do ancient Indian myths tell stories about encounters between different human species from prehistorical times? May be one day the technology will be able to provide better answers to such speculative questions. More likely, these will remain speculations. However, I like the idea that our old Indian myths and stories can remember events from the dawn of the humanity before we had our languages and identities. I like the idea that the archetype chimpanzee grandmother of Yuval Noah Harari is still remembered as the mother of Hanuman in our stories. 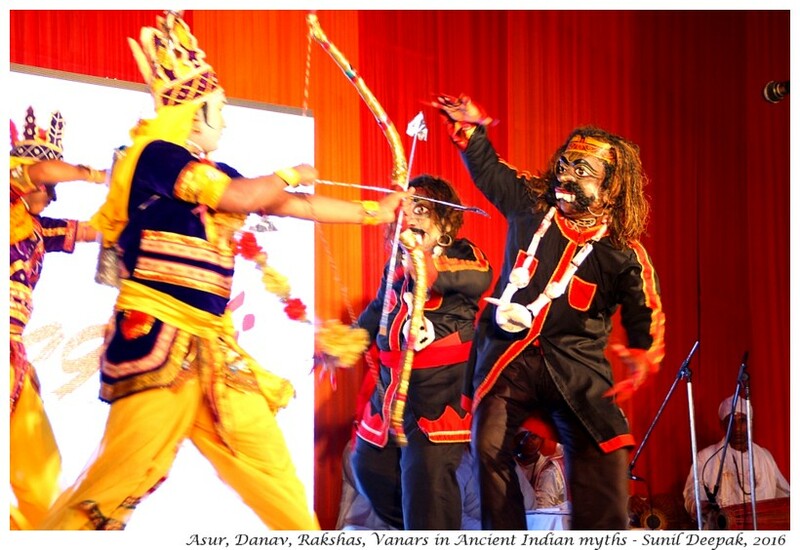 That our Neanderthal cousins are still there with us as Ravan, Kumbhkaran and Meghnath in the Ramlila plays. That our Denisovan cousins are not lost for ever, they live in the Puranic stories of India. I think that "Sapiens: A Brief History of Humankind", is a wonderful book. If Human history interests you, it will give you a lot to think about! An absolutely fascinating post Guddu mama! Coincidentally, I have been reading a lot about the history of humans and humanity as part of my Social Science sessions with our homeschooling group. I had goosebumps when I learnt that we were not the only human species inhabiting earth - that much like other species, there were several of us. I always knew them by their biological names, but only on reading about them in details, did I begin to understand our shared history. I am now trying to understand the evolutionary significance of the other species 'dying out' and the continuity of Homo Sapiens or perhaps they just got integrated through interbreeding. I was reading de same book( harari- a brief history of humankind ) and my thoughts went in de same direction. Did Google search and landed here. Super post.. I have been thinking about this for last couple of weeks. Nicely presented.